EDIT: Giveaway is officially over. Congratulations to Lucki Grrl for submitting the randomly-chosen 161st entry. Are your pets as spoiled rotten as mine? Then you won't want to deny your cat the purrrfect prize. 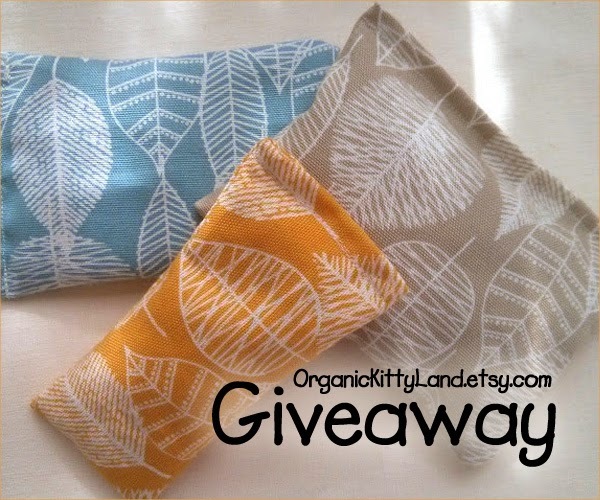 Moira of Organic Kitty Land is giving away three catnip pillows to one lucky pet owner. The catnip pillow set is handmade using three colors from the Bark & Branch pattern collection by Cloud9 Fabrics. The organic cotton canvas fabric is filled with 100% USDA Organic Catnip. Moira's cute kitty loves playing with his catnip pillow. But don't worry, he has not been used to model any of the pillows that are for sale, nor have they been exposed to cat hair. Many cats like to chew on their pillows, therefore it's important that they don't contain toxic residues. That's why Moira makes her pillows with cotton that's grown in organic soil with no toxic pesticide sprays. Formaldehyde, chlorine bleach and other heavy metals such as lead are not used in fabric processing, whitening or dying. She wants to help all kitties be as healthy and playful as possible! Use the Rafflecopter below to enter to win worldwide giveaway before 11:59pm EST on August 10, 2014. Be sure to leave the mandatory comment on the blog post with the same name you use to fill out the Rafflecopter - all entries by winner must be easily verified or a new winner will be chosen. Not including usernames when asked will also get you disqualified. The black and blue one is so cute! I love the Gold Leaves Catnip Pillow! https://www.etsy.com/listing/188357592/hemp-catnip-pillow-gold-hemp?ref=shop_home_active_6 Great products. Thanks for the chance to win. (Taj Kingston) I like the Hemp catnip pillow! well I really like the CATS, but i'll settle for the house and flowers pattern! I like the gold leave cotton pillow. My kitties would love it! ~Emily S.
I love the blue leaves! I like the Black and Blue catnip pillow and so would my old lady kitty! I like the red flowers pillow ! I like the Organic Cotton Catnip Pillow in Orange flowers and pink and I know my kitties will love the bright colors and shape! I really like the organic house pillow. I'm just amazed at how low the prices are! I love the organic catnip pillows. Your Egyptian Maus appear to love them. My Egyptian Mau loves catnip, so I know this would be just what the Dr. ordered for my very insecure sweet EM. It is great that companies are making useful items without my allergens: chlorine, etc., and that my cat can benefit from it. He'd love the gold colored (that's his color) catnip pillow. I like the GOTS certified Organic Cotton - Birds. I love the tan flowers catnip pillow! This looks like my Egyptian Mau devouring his catnip pillow. Love it! My favorite is the Organic Cotton Catnip Pillow - GOTS certified Organic Cotton - Blue Leaves. I like the Organic Cotton Sateen Catnip Pillow - GOTS certified Organic sateen - Sky blue. I like pink zig zag! It would be a cute design to have the pillow wherever the cats took it. My rafflecopter name is Ashley Nicks. Thanx! I love the Organic Cotton Catnip Pillow - GOTS certified Organic Cotton - Blue. I like the Organic Cotton Catnip Pillow - GOTS certified Organic Cotton - Birds. I love the Organic Cotton Catnip Pillow - GOTS certified Organic Cotton - Black and Blue - Organic Catnip pillow, but really all of your stuff is super cute! I love all the catnip pillows! The hemp pillow looks good. I like the Black and Blue catnip pillow. I like the one with the little birds on it. I have 2 "grandcats", and they'd love ANY of the catnip pillows. I love the Blue Leaves catnip pillow! I really liked the Organic cotton and Hemp Catnip Pillow - Hemp,Organic cotton - blue hemp, houses, green twill but I am sure the kitties will love it to pieces! I love the black and blue one! I like especially the GOTS Tan Flower organic cotton catnip pillow. Thanks for the giveaway. I like the blue catnip pillow. But everything is really cute. I love the Organic Cotton Catnip Pillow - GOTS certified Organic Cotton - Orange flowers and pink. My kitties would go bonkers over these. Organic cotton and Hemp Catnip Pillow ? That sounds like one loopy kitty! I like the gold leaves catnip pillow!! SOOOO CUTE for our kitties. I love the blue catnip pillow too. I love them all though. The Egyptian Mau chewing on the blue catnip pillow makes me smile every time. Just like mine. I love the cat licking the blue pillow. The organic cotton is nice. I love the trio of blue og catnip pillows. I love the Organic Cotton Sateen Catnip Pillow in Sky blue. I love the golden pillows. Hemp Catnip Pillow - Gold Hemp. My cat would probably eat this! I like the hemp and organic pillow. This is my absolute favorite. Looks just like my cat enjoying a catnip pillow. I like the blue leaves pillow! I like the blue pillow in the organic cotton category. I like the Organic Cotton Catnip Pillow - GOTS certified Organic Cotton - Organic Catnip. My favorite is the green catnip pillow!